I found an article that says I can just send in the form by itself without ammending my prior year taxes, but I don’t see that clearly spelled out in the IRS instructions. Has anyone done this? Do I need to file the prior 8606 before I complete this year’s taxes? If I call the IRS help line will they be able to work through this with me? 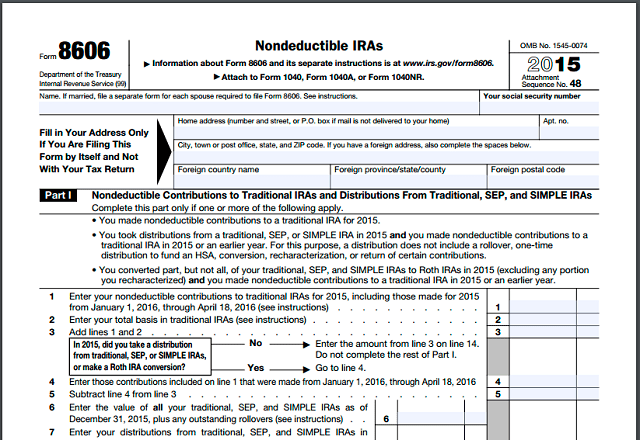 File IRS Form 8606 to report nondeductible IRA contributions overlooked in previous tax returns. You have unlimited time, but there can be penalties. This year (2018 taxes) I’m much more on top of tax law since I certified to volunteer through VITA. I decided to use TurboTax for my own taxes since they should be relatively simple. My estimated refund was smaller than I expected and when I looked into the forms, it’s because I don’t have any established basis in my traditional IRA. It’s very clear to me that TurboTax is calculating everything correctly and the mistake is mine. I actually have a basis of $5500 but I can’t prove that since I didn’t file 8606 last year or the year before. I haven’t been doing this either. Yikes! I haven’t filed for 2018 yet, but I need to do 2016 and 2017’s forms too. It is indeed ok to just send in the form 8606 for the prior years on it’s own (no 1040x needed). I’m going to do this for 2016. The person I spoke to said to send it to the same address that you would send your normal and/or amended tax return. They said to go ahead and file normally for 2018 even though I haven’t sent in the 2016 or 2017 8606 forms yet. *I am not a tax attorney/accountant, and I don’t work for the IRS so please don’t take this as any sort of official tax advice. Have you been able to get one of the services online to kick out an 8606? It’s likely user error, but I’m trying with both Credit Karma and Turbo Tax and neither is creating an 8606.